I wanted to send a quick update on my marathon run today. I am very glad to say I finished in qualifing time for the Boston marathon. My qualifing time is 3:30:0 but I finished todays marathon in 3:03:03. Whoohoo!! I am very happy to finsh 27 minutes ahead of the time I ran 11 years ago in Columbus. Holy Cow!!! That is awesome!!!!! Way to crush your old time...You're Boston bound now! Congratulations. Enjoy the rest of your evening. Hope you have a nice hot meal to look forward to! Congrats! Great time and 109 overall, that's amazing!! Great run! All your hard work paid off. WOW! excellent PL!!!! i knew you'd do well you are so fast, but to BQ is just so impressive, and to PR that race is just way cool. congratulations! thanks for the "quick update" i've been wondering! I'm glad you wrote your name so big on your bib. I found you right away. Way to hang tough today. Congrats Lou! You ran a gutsy race! I am very proud! Congratulations Lou! That is incredible! Boston bound!! 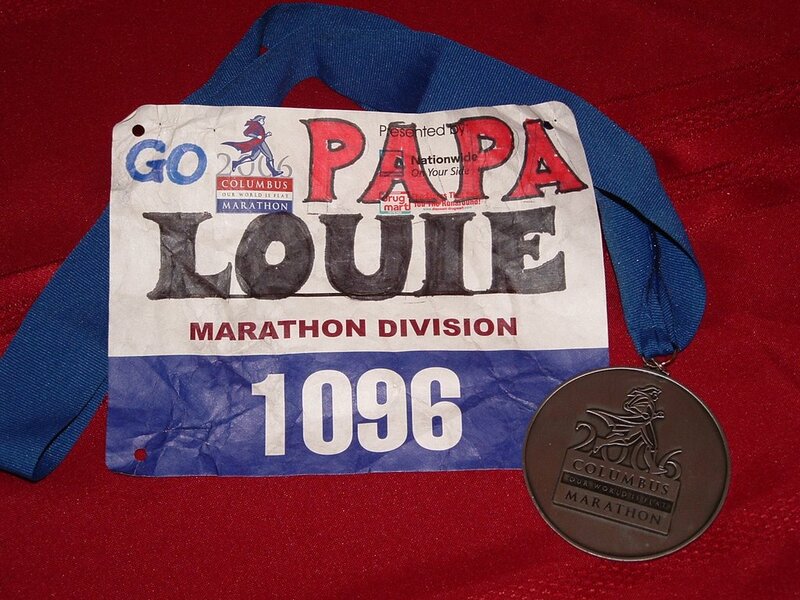 Congratulations Lou! Your story has really inspired me this past training season! WOW!!! That is awesome! Congratulations on an great race! Awesome race time. I'd like to be around that next year for a fall marathon. 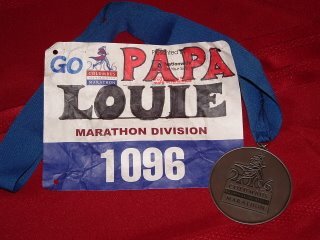 Lou, Congrats on your BQ. What a smokin' time! WOW!! What a great race time!!! Congrats on that huge PR and what a nice BQ!!!!!! Way to go!!! Hope to catch you on a few easy runs in the next few weeks. And maybe some of your speed will rub off on me. I checked on you Sunday afternoon--HUGE congrats! A big Congrats! looking forward to the full report. That is totally AWESOME!!! You'll have to give us a rundown on how you feel about the FIRST plan now that your marathon is finished. You kicked some major bootie! You continue to amaze and inspire me!